What did the master give to the men? What did the (first, second, third) man do with his money? God has given us abilities that He wants us to use. What is a talent that God has given you? Verse: Colossians 3:23a (NIV) - Whatever you do, work at it with all your heart, as working for the Lord. - God has given each of us talents that we are to use for Him. 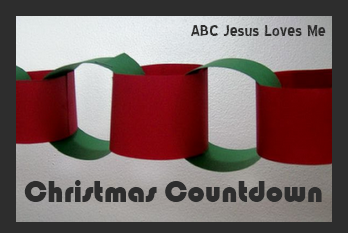 Use this time to point out positive characteristics that you see in your child that God can use (i.e. servant's heart, encouragement, leadership). We do not know what the talent of each of the men in the parable was but we know two of them used their talents for God. - In the top tier of the "Bee" Attitude worksheet, have the child write the attitude of the week. In the next tier, have the child draw a picture of the Bible story. In the bottom tier, ask the child to draw a picture of himself using his talent for God. Make a poster focusing on the memory verse. The heart is created with two prints laid overlapping at an angle. The finger tips are at the bottom of the heart. Keeping the fingers tight, paint the entire palm of the hand. You can also make small hearts using two thumb prints. Add the title "Working for the Lord with all my heart." Using numbers 0-10, have the child place flashcards in number order. - God created us with feelings (i.e. happiness, sadness, anger, fear). Having each of these feelings is not wrong but how we express these feelings is where problems occur. - Use the Teaching Emotions worksheet to teach the child how to read faces. Print the printable onto cardstock, color and cut out the faces, and then glue them onto craft sticks for strength. Have the child choose a different color for each emotion. Discuss why he/she chose that color. • Ask the following “How do you feel when…” questions. Each question may have more than one answer. Have the child explain why they chose each emotion. You just found out that your grandparents are coming today and bringing you a very special surprise. You dropped a big object on your foot. Your little brother/sister broke a tower you just finished making. You picked up all of your toys without being asked. A group of friends won't let you play with them. A friend calls and invites you to come over and play. Some people you don't know are coming over today for supper. Have the child lay on a piece of butcher block paper. Trace around the child. Ask the child to finish the following statements and write the answers on the traced body according to the directions below. Color each part of the body to designate the color the child associates with the emotion. Have the child color her name her favorite color. Add a face and yarn hair. You will learn a lot about the child if you probe deeper into the responses. The child's love language may come out too! - Place various household items in a bag or box. With eyes closed or using a blindfold, have your child feel and identify each item. Example items: toothbrush, remote control, crayon, toy car. - Rub different clothing in a closet. Discuss the feeling (i.e. coarse, soft, smooth). - In a large container, place rice, lima beans, and/or other dried foods to play in like you would a sandbox. This is an excellent sensory activity that can be done inside. It is especially nice when the weather is not conducive to being outside. Read any Touch and Feel Books. - Talk with your child about the function of her eyes. Ask her to identify the job of her eyes. Explain that most people have eyes. Eyes are different colors and different shapes, but the function of the eyes is just the same. - Seated on the floor, blindfold your child. Place four or five similar objects in front of him. Ask for a particular object. Allow the child to feel the objects. Discuss that some people cannot see, and that we should be thankful for our eyesight. - Play Pin the Tail on the Donkey. Use the Gg Writing worksheet and for further learning check out the Letter G Activities. Using number flashcards, point to and count each number. - Discuss the place where the majority of the story occurs. - Talk about the setting of God Gave Us Christmas. In this book the main setting is the Arctic with minor settings along the bears' travels. 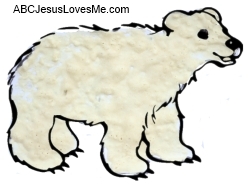 - Create a Puffy Polar Bear with the Polar Bear worksheet. Mix: 1/2 cup flour, 2 tsp baking powder, 2 tsp salt, and enough water to make the mixture into a paste. Place the mixture in a ziptop bag and mix ingredients. Cut off the corner to pipe the mixture onto the polar bear. Once the polar bear is covered, dab the mixture with your finger to make the mixture look like fur. Place the paper in the microwave for 20-30 seconds at a time until the mixture has risen and is fully baked. Discuss how the baking powder forms air pockets in the mixture causing it to puff up. - While reading the book, discuss what the bears taste or touch in the story.